The leftist government’s ‘reforms’ guarantee that Greece will remain in the headlines. 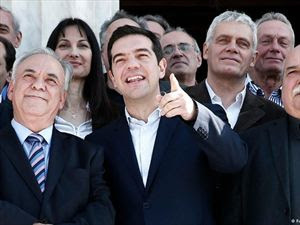 The left-wing SYRIZA came to power in Greece last year promising to end the austerity programs of the Troika (the European Union, International Monetary Fund, and European Central Bank) and to return to the pre-crisis normalcy of hefty government spending, early and plentiful public retirement plans, and a slew of new openings for public-sector employment. SYRIZA had promised the voters that it would be a return to the good old days: Have the courage to vote for us, SYRIZA told the voters, and we will have the nerve to confront the European reactionaries. Now, after nearly a year in power, SYRIZA is passing through parliament a new set of austerity measures that mostly aim to balance, on a budgetary level, the economic consequences of SYRIZA’s “negotiations” with Greece’s European creditors during its first seven months in power. The end result of those seven months was capital controls for the banks and an economy that went from growth back to recession. There has been a complete collapse of government revenues, which has resulted in the government’s paying salaries, pensions, and not much else. It must be said that the new austerity measures, which are often amusingly termed reforms, are for the most part tax increases — which may not be popular, but which conform to SYRIZA’s ideological creed. The new package agreed to by SYRIZA and Greece’s creditors is about 90 percent new taxes or tax increases and 10 percent reforms. The tax increases have the benefit of protecting SYRIZA’s core constituency, which is the public-sector employees. Despite the collapse of public revenue and the overall dismal economic outlook, the SYRIZA government plans to increase the salaries of public-sector employees (by as much as 8 percent) and carry on with 45,000 new hires in 2016. Meanwhile, in the private sector, SYRIZA has increased taxes on all sorts of things and is planning to double the taxation of farmers. It has increased business taxes and also demanded the pre-payment of business taxes. It has increased the VAT on almost all goods, and it is defining affluence down so as to increase income taxes for a greater number of taxpayers. And although Greece has probably the highest social-security contributions in Europe, SYRIZA is planning to increase these contributions even more, despite the fact that pensioners now outnumber those who are still employed in the private sector. Behind this policy madness is a very cynical ploy by SYRIZA, which aims to preserve a large voting block of public-sector employees and pensioners on its side. In the fragmented political landscape of post-crisis Greece, that ploy almost guarantees SYRIZA first place in the polls. That wouldn’t amount to much, though, if it were not for the fact of the Troika’s tacit acquiescence to all of this. If something has been clear in this six-year bailout period, it is that Greece’s European creditors don’t care a lot about the quality and the economic viability of whatever measures the Greek governments propose, as long as they can show in an accounting sort of way that these measures can balance the books. That strategy guarantees that Greece will remain in the headlines for years to come. In other policy areas, SYRIZA is doing its utmost to appease various groups, especially those that constituted the party during the decades when it received only 3 to 4 percent of the vote. Radicalized academics, public-sector union bosses, and environmental and immigrant activists all get some form of political advantage. For instance, one of the first actions of the SYRIZA government was to introduce laws that would allow for an early release from prison of domestic terrorists. Another one was the abolition of elite public schools, on the theory that academic excellence constitutes a kind of stigma for the students attending them. By far, though, the principal change in domestic policy was SYRIZA’s decision a year ago to open Greece’s borders. Up to that point, Greece had been seeking to discourage immigrants from crossing its borders. But last February, the newly elected SYRIZA government decided to abolish the centers that were holding illegal immigrants; instead, it would give them permits for a six-month stay, which can be renewed an unspecified number of times. These permits were offered to anyone who decided to enter Greece, no matter the reasons and the circumstances of his entry. Since then, a flood of refugees and immigrants has followed. This decision, by a minister of immigration who was formerly an activist immigration lawyer, to change Greece’s immigration policy has startled Europe. In an era of relatively strict budgetary constraints, governments of the left will try to insulate core constituencies from the burdens of a new austerity. This kind of insulation from reality is the new highly sought advantage. From a period where privilege was defined by how much the government would give you, we have arrived in a new era where privilege is based on how little government is prepared to take from you. In areas of domestic policy, leftist governments will continue to press the agenda of the New Left, increasing immigration, defining real crime down, expanding political censorship, and undermining every traditional institution of society. In short, it will try to do as much damage as the last time it was in power, but with less money.